In the early 1990s two professors, Irene Fountas and Gay Su Pinnell, used their experiences as classroom teachers, professors, and their work with Reading Recovery (a one-to-one reading intervention program) to team together and create a way to level books for readers. Their system called Fountas and Pinnell for guided reading matches leveled books to readers. I was teaching kindergarten in Iowa during this time and took many of these guided reading classes and read Fountas and Pinnell’s first book, Guided Reading: Good First Teaching for All Students. I even heard Gay Su speak at a conference. From then on, this is how we taught small groups for reading, using the F&P system. Since then Fountas and Pinnell have refined their system and have written more books and assessments to help teachers teach reading. 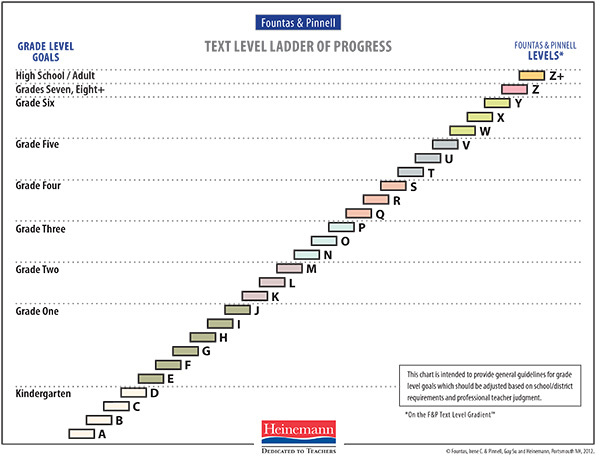 Publishers have added the F&P levels to their books. So what does this system have to do with you as a writer for an educational publisher? Well, you should become familiar with the F&P levels so that when you write for a specific level, you know what the reader can do. So let me try to briefly explain this system. The F & P system is leveled A-Z, with A being the first level and Z ending in high school grades. Take a look at this text gradient. A student entering kindergarten will work through four levels. 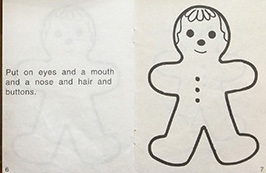 Level A: one line of text, very easy for young children with illustrations helping kids figure out the words, repetitive, big print and big spacing between words. Look at these examples. 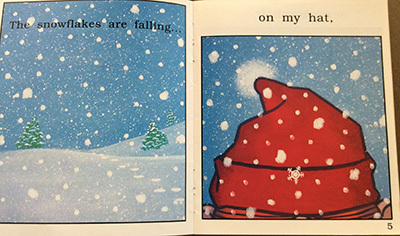 The first book is from The Hungry Fox, which consists of only 12 words! This also has repetitive text with only TWO words on each page, but it still tells a complete story thanks to the illustrations! “The fox, the farm, the dog, the henhouse…” The second book is called The Farm, and the pages repeat. “Here is the pig. Oink oink. Here is the cow. Moo-moooo.” And so forth. 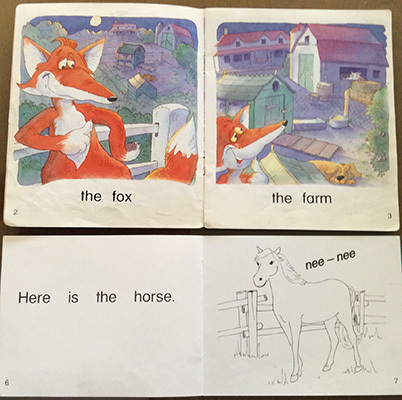 The children learn the sight word “here.” The words pig, cow, and horse can be determined from the illustrations. 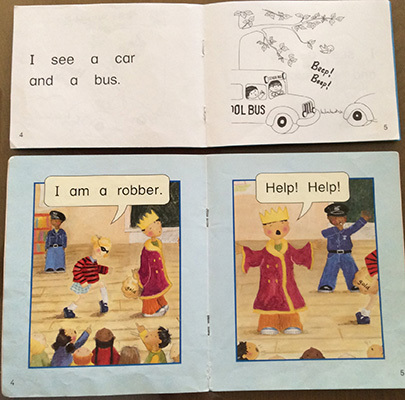 The last page of these guided readers usually has a surprise or a twist ending. Level B: more lines of text, slightly greater range of frequently used vocabulary, some repetition but not always. See these examples. The second book only has 23 words. Level C: longer than B books, 2-5 lines of text on a page, more story carried by the text than the illustrations, full range of punctuation, sentences are a little longer, more variation in language patterns. “I am asleep,” said Dad. And here’s a sample from Gingerbread Girl, which only has 44 words, but you can see how the word count is increasing in each level. 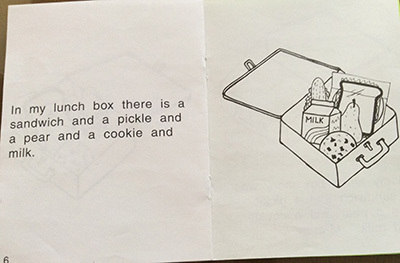 In this book Lunch Box, there are 89 words. And you’ll be pleased to know, I have this guided reading book from KAEDEN, our target publisher. 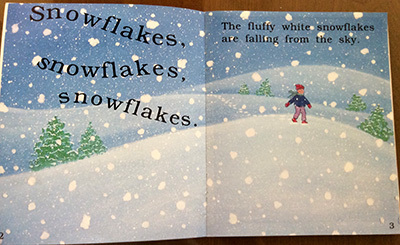 This book Snowflakes, (F&P level D) has 54 words and 11 pages of text. 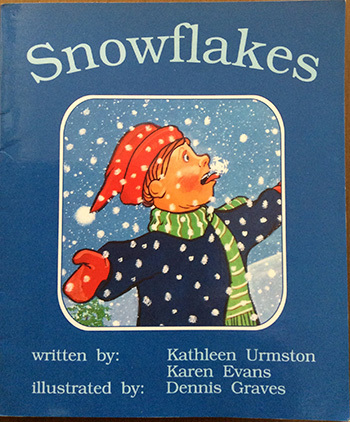 This boy tells all the places snowflakes fall on him. Level E: 3-8 lines of text per page, more complex stories, ideas might require more interpretation, text carries the story line, problem solving needed to figure out new words, longer words, inflectional endings used, some concepts may be less familiar to kids. I have another book from KAEDEN for this level! The Quarter Story has 99 words. 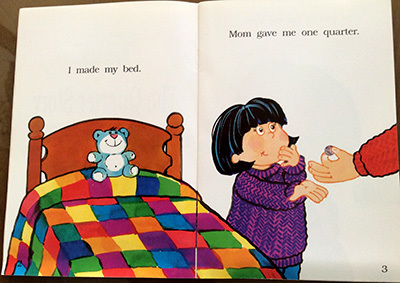 In this story the girl does various chores to earn a quarter. Once she has four quarters she goes to the store where she figures out that her four quarters are the same as $1. An example of Level F is Cookie’s Week. Click the link to Amazon and use their “Look Inside feature” to read some of the text. And here’s another example of Level F, Little Bulldozer Helps Again. An example of Level G is The Lion and the Mouse. Level H: more complex language and vocabulary, longer stories, literary stories, less repetition An example of Level H is Super Fly Guy. An example of Level I is Henny Penny and Leo the Late Bloomer. Level J: Some books at this level are beginning chapter books of 30-60 pages which may use shorter sentences and familiar vocabulary. I hope these examples helped you understand more about the F&P leveling system. Which level do you think you’d be comfortable writing for? Check Kaeden’s books on that level and study them. You could even order some in to get more of a feel for the structure. WOW!!! Thank you Tina, for all your amazing and wonderful help. You rock!!!! Terrific post, Tina! Extremely helpful. Thanks Tina, this is very interesting and the graph actually helps us to reign in our writing for specific age groups. Thanks. WoW! Thank you Tina for taking the time to share this. It must have been a fairly big undertaking and is much appreciated. Thank you so much Tina! It’s great to see you here and it’s always a pleasure to read your post. 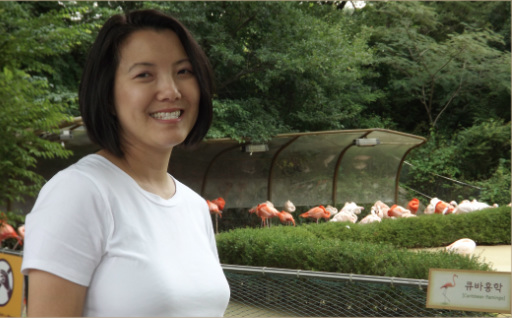 This post helps me in two aspects: a new writer to understand the target reading level and a Chinese mom to understand what my second grader is supposed to read in the US. 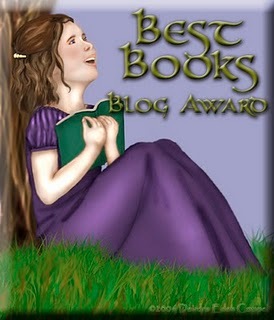 Thanks, everyone, and Nancy, for allowing me to guest post. It was a privilege to help! Great resource, Tina! Thanks for sharing! Will definitely keep this post handy. Thanks, Tina! Very helpful. 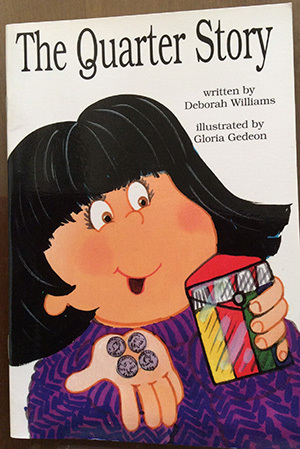 It was funny to see that there is an early reader author named Deborah Williams–that’s my name, too! 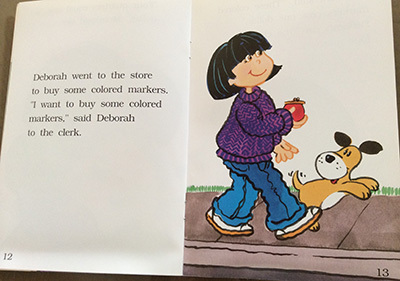 But I write my easy readers under my full name, Deborah Holt Williams. I’m published by Continental Press but would like to try Kaeden, too, so thanks for the tips! Excellent post, Tina! Very helpful and clear. The examples were especially helpful in understanding the levels. Thank you for taking the time to share all of this. And thank you, Nancy, for hosting. What a thorough job explaining the levels. As a home schooling mom and former “official educator,” you are the right person to write this post.